1.1 When and how to shave? 1.2 Shaving along or against the hair growth? 1.5 What to choose: composite of several razor blade or razor with a simple single blade? 1.6 The skin type and choice of shaving – what is the connection? 1.7 Should I use a shaving cream? Many men believe, they know, how to shave. In their opinion, it is enough to buy an electric shaver, a novelty. It turns out, that this procedure should be carried out taking into account the correct hair removal from the face of the skull. Otherwise, do not avoid irritation. Shaving for many men is a daily procedure, which has minimal effect on the skin covering the face. When shaving removed the upper layer of skin cells, Therefore, a person needs a little help. It consists in using means for shaving skin moisturizing. When and how to shave? There are several opinions, associated with the, when and how to shave. Universal answer to this question is to shave after a hot shower. Usually, hot water and steam help to mitigate the beard and the opening of the beard for a smooth shave. 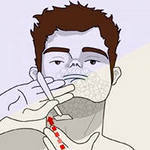 If men stiff bristles, then you need to use a special tool, which removes dead skin cells, raising the beard. In the process of selection of the tools you need to consider, that it should be used 2-3 days a week. maybe, buy a similar tool for daily use. Shaving along or against the hair growth? Procedure, how to shave, It carried out taking into account the direction of hair growth. If a man has a shave against the direction of hair growth, then the blade rigidly affects the skin, leading to the appearance of burns, cuts and ingrown hairs. To find out, how best to shave: along or against the hair growth, it is recommended to hold a razor once in each direction. To prevent burns, some men are advised not to shave against the direction of hair growth. For this purpose, you need to use only a clean, sharp razor. The new blade allows smoother shave. The number of sections is reduced to skip, and the skin on the face is not easily provoked. After each use, the razor should be washed. It will remove hair, stuck between the blades. 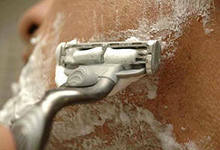 When using electric razor blade should be cleaned before or after each use. In any case, after shave is recommended to spray the person with water. This will close the pores, reducing the possibility of irritation. The choice of aftershave depends on the skin type. For oily skin need to buy aftershave, which will dry the skin. For dry skin agent chosen from moisturizing effect. Anyway, lotions do not contain alcohol. Since the skin because this component is stretched and dry. Buy aftershave need-based oils. They are able to moisturize the skin. What to choose: composite of several razor blade or razor with a simple single blade? How to shave, applying a composite of multiple blade razor or razor with a simple single blade, It depends on the ability to handle data units. Razors with multiple blades allow shave more smoothly, providing, in this way, the desired control. Optimally, you can shave using odnolezvennyh predecessors. Led by such an instrument should be evenly and accurately. The main difference between these units is, that razors with multiple blades have some limitations, associated with the ability to precisely repeat the contours of the face. With regard to the simple blade, it can be rotated at any angle. The skin type and choice of shaving – what is the connection? In the process of shaving should be cleaned regularly used unit, Always apply the foam and moisturize the skin. 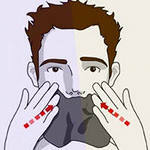 However, regardless of the razor, Shaving should be chosen taking into account the skin type. Should I use a shaving cream? Shaving cream is not necessary to use. Some men have it replaced with the gel, oil or soap and shaving. Verified alternative means of shaving cream is olive oil. The key to a good shave is a sharp cutting surface. the main thing, that used a razor blade or sharp have been. How to shave at the preparatory stage, not all men know. Initially, it is recommended to soften the skin and stubble, preparing face to hair removal. Quickly it can be done with hot water. For this towel is wetted in the liquid, after which he served for a few minutes face. After such a shaving procedure will slide easily over the skin surface. In this case, even dangerous machines can be used for shaving. Another component is the preparatory shaving foam. It is applied to the skin evenly. This tool allows the razor to glide gently and smoothly over the skin surface. Cream or lotion after shaving apply for skin regeneration after traumatic manipulation. 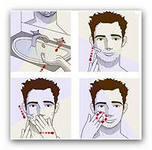 Distribute the foam evenly on the face can be hand or by using a swab. Not the tool is recommended to rub into the skin. Further bristles is cut using the machine. To begin this process should be to cheek. Hand with razor should move downwards along the hair growth. However, men often shave against the bristles. Further, similar movements are carried out on the cheeks and chin. Prior to this, it is recommended to rinse the shaver under the tap. Since hairs stuck blunt machine data, preventing tight contact with the skin face, forming, in this way, cuts and wounds. Further, procedure, how to shave is to shave the neck. Where ingrown hairs appear more often. The mustache is the last part, which shaves. This will require a lower his head down, pulling the skin for shaving hair in the folds. In such places it is necessary to work with a razor in various directions. Rinse shaving foam need cold water. In this case, open pores, and calm the skin. Then you need to check, as a shaved face. In identifying not shaved skin areas, should be removed. 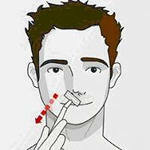 It is also necessary to clean the razor and put on the face aftershave.